The SARGUN Semi Auto Pistol is a truly new and unique handgun design. It starts with a polymer frame with an adjustable grip, multi-caliber frame, fully ambidextrous controls, loaded chamber indicator, drift adjustable front and rear sights, integral accessory rail, square barrel lockup and low profile controls. 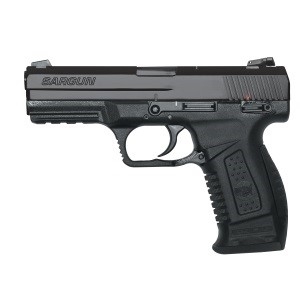 This is a full size high capacity pistol in popular calibers with a grip envied by the competition. Available in blue or stainless steel upper. Ships with a complete array of accessories.